I twice promised an entry about the Razzie nominees, so it's time to follow through. Without any further ado, here are the 39th Razzie® Award Nominations! With a stumbling stock market, a possible impending Presidential impeachment, raging wild fires, devastating floods, mass shootings and a litany of plagues that reached near Biblical proportions, 2018 was a year overfull with disasters. This wouldn't be a Razzie field without some bad speculative fiction movies. This year, it's "The Happytime Murders," "Winchester," and arguably "Robin Hood." 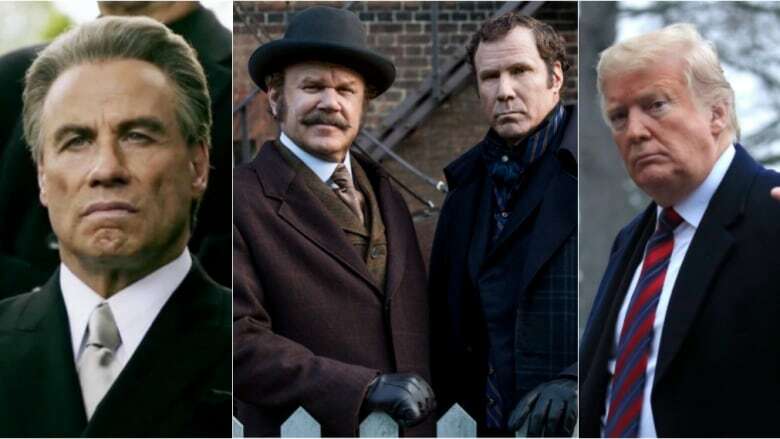 As for bad movies about politics and government, I will have to settle three, maybe four, nominees about crime and punishment, "Gotti," "The Happytime Murders," "Holmes & Watson," and again arguably "Robin Hood." Between these two ways of slicing the nominees, I've managed to nick all of them. This field has more crime and punishment with "Peppermint," which I had high hopes for as a female-led action movie. Its nomination for Jennifer Garner along with those for the rest all appear to be examples of bringing big names (more or less, Amber Heard and Amanda Seyfried show more promise than achievement) down low. Without the Razzies, I'd probably never have heard of either "London Fields" or "The Clapper." Maybe I would have been better off. Now the first of four nominations for "Death of a Nation," a sequel of sorts to "Hillary’s America: The Secret History of the Democratic Party," a four-time Razzie winner. Yes, readers, your eyes are telling you the truth. President Donald J. Trump earned a nomination for being himself in two movies, both of them documentaries. At least I'm taking his and other nominations for "Fahrenheit 11/9" as a comment on Trump, not the movie. Also, I suspect having Amber Heard and Johnny Depp both being nominated for acting awards in the same year is the Razzie Awards voters' idea of a joke. If so, it's not very funny. Still, it's another nomination for speculative fiction. Oh, look, a nomination for a movie, "Jurassic World: Fallen Kingdom," that might also earn a Oscar nomination or two for Best Visual Effects or Best Sound Editing. Add that to the nomination for "Show Dogs" and it's two more for speculative fiction (I am counting "Show Dogs" as fantasy). Now for more political nominees. Kellyanne Conway and Melania Trump are competing against each other in "Fahrenheit 9/11." At least they didn't earn double nominations for being in "Death of a Nation," although I suspect the D'Souza documentary might have had their nominations in the Michael Moore film misattributed to it. Also, my prediction that "Fifty Shades Freed" would earn at least one Razzie nomination came true even though the one about it earning a Grammy nomination didn't. Sorry, 2018 was too good a year for movie songs. Finally, add "Slender Man" to the roster of bad speculative fiction films nominated. Finally, a category with no new nominees. Also, I think Will Ferrell & John C. Reilly should win, but if I voted, it would be for Donald J. Trump & His Self Perpetuating Pettiness. Hahaha! Too true! And "The Meg" makes for the final speculative fiction nominee. As for "Death of a Nation," it was lucky it wasn't nominated for Worst Picture, too. And Dinesh D’Souza should consider himself lucky he wasn't nominated for Worst Director. However, he didn't escape being nominated for the next category. The Razzie Awards tried to be helpful by providing the following, but managed to be incomplete in interesting and possibly revealing ways. That, or they failed at math. First, I only count four nominations for "Death of a Nation," not six. The only way it could have earned six would be if the Razzie tabulators screwed up by counting Kellyanne Conway and Melania Trump's nominations for "Fahrenheit 11/9" as part of the total for "Death of a Nation." Oops! Speaking of which, the total doesn't list "Fahrenheit 11/9" or its four nominations. Remember when I wrote that "I'm taking his and other nominations for 'Fahrenheit 11/9' as a comment on Trump, not the movie." This omission strengthens my suspicion. That, or the Razzie tabulators were sloppy. Either would work. Also, "Sherlock Gnomes" earned two nominations, both for Johnny Depp. That one I'm chalking up to sloppiness; the Razzies certainly wouldn't cut Depp any slack! So, just for completeness, "Death of A Nation" earned four (not six) nominations, Donald J. Trump (As Himself) for Worst Actor, Donald J, Trump & His Self Perpetuating Pettiness for Worst Screen Combo, Worst Remake, Rip-off, or Sequel, and Worst Screenplay. "Fahrenheit 11/9" also earned four nominations, Donald J. Trump (As Himself) for Worst Actor, Donald J, Trump & His Self Perpetuating Pettiness for Worst Screen Combo, and Kellyanne Conway and Melania Trump as themselves for Worst Supporting Actress. In case any of my readers want to vote, click here and pay $40.00 for a buy one, get one free special. I'm not done with entertainment. The Oscar nominees come out in the morning. Stay tuned!